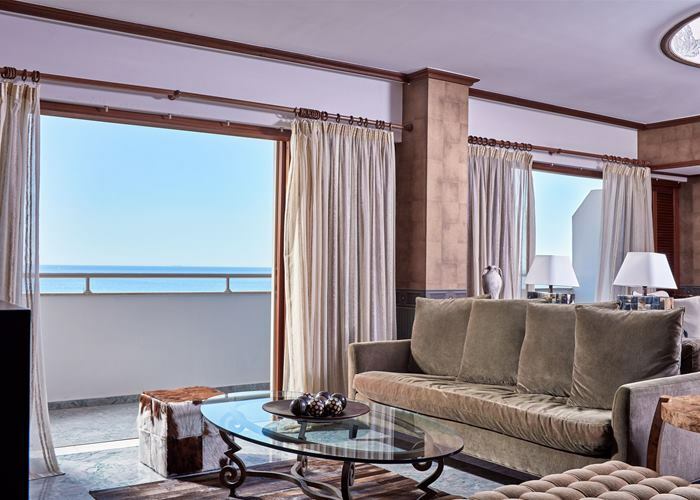 Set on a hillside looking out to the sapphire-blue seas of Limassol Bay, the Atlantica Bay is a truly luxurious retreat that makes the perfect spot for a couple’s holiday. Surrounded by a peaceful and quiet environment with lush grass areas and a massive lagoon shaped pool will make your holiday the one to be remembered. 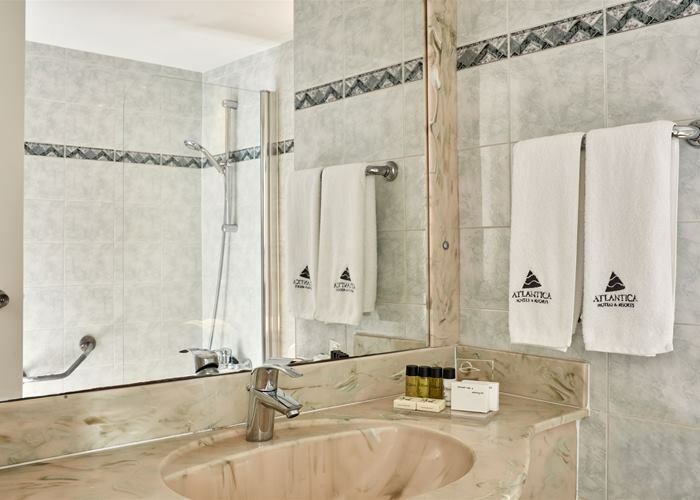 The facilities here are first-class too, so what are you waiting for? 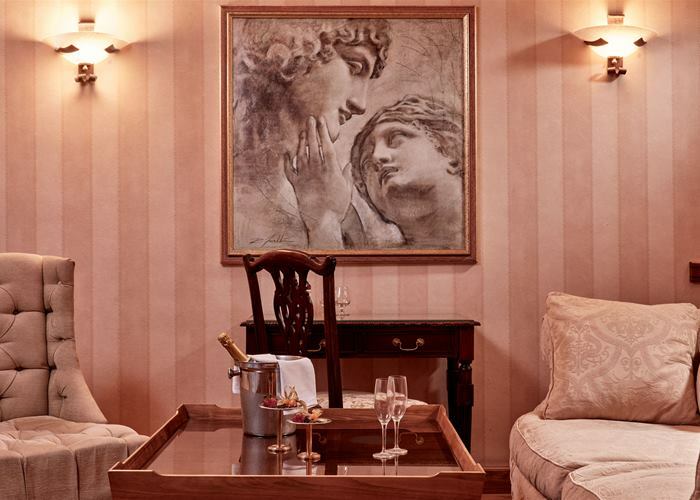 The hotel is ideal for couples above the age of 16 years old. Twin or Double rooms sleep up to 3 people and offer ample space with clean-cut décor and a fresh modern feel. These tastefully decorated rooms are well designed for maximum comfort with twin or double bed. Rooms include all the holiday essentials such as mini fridge, LCD TV and air conditioning. Twin or Double rooms sleep up to 3 people and offer ample space with clean-cut décor and a fresh modern feel. 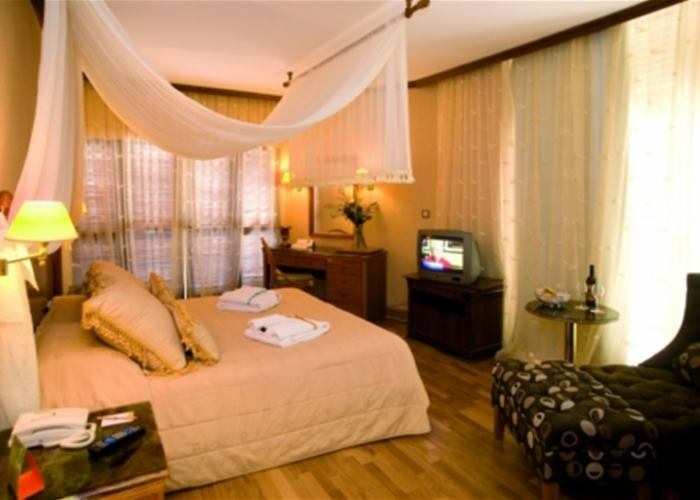 These tastefully decorated rooms are well designed for maximum comfort with twin or double bed. 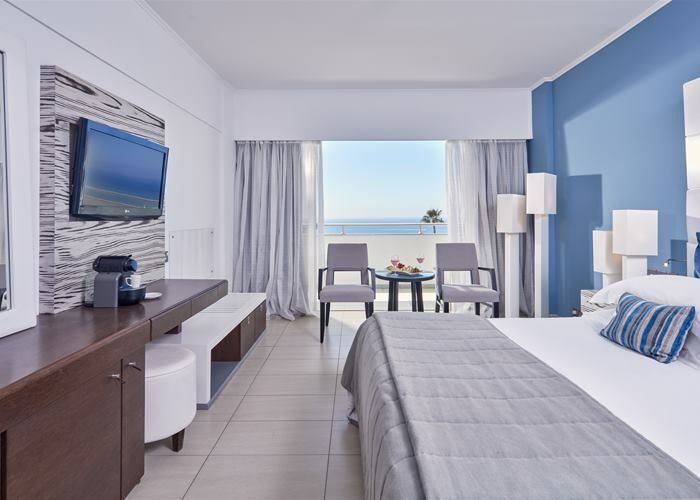 These sea view rooms include all the holiday essentials such as mini fridge, LCD TV and air conditioning. 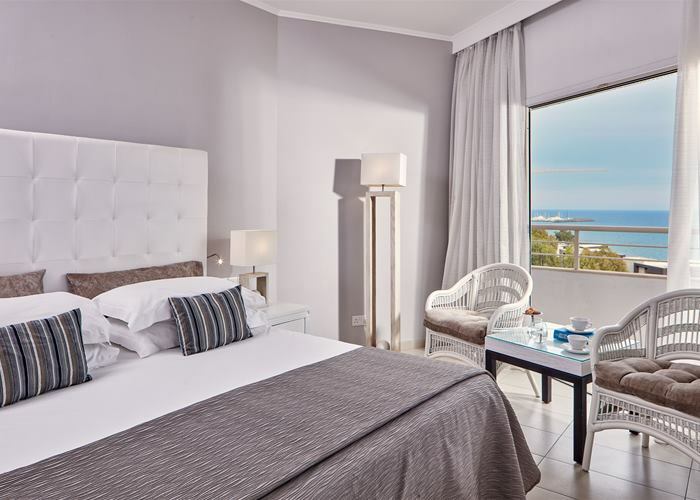 A beautifully furnished room offering more space compared to our standard rooms with views overlooking the sea. 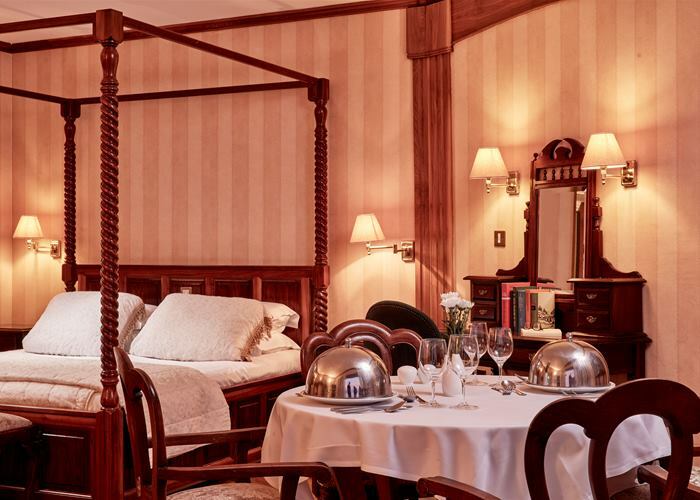 These rooms come with a double bed and sleep up to 3 adults. A welcome of fruit & wine await your arrival along with the included bathrobes & slippers, mini fridge, LCD and air conditioning. 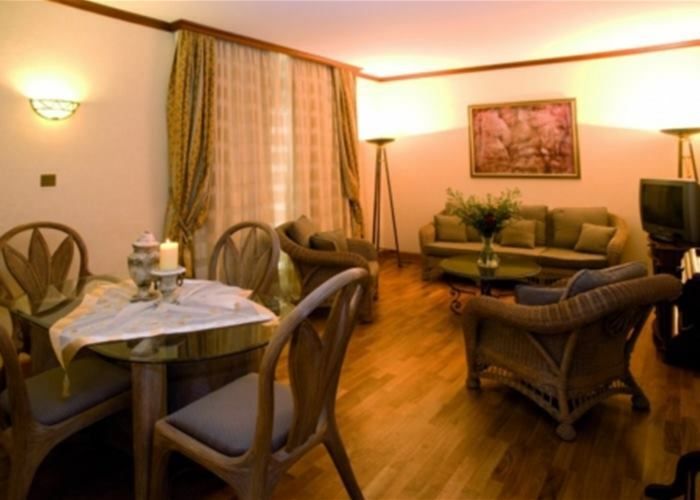 The room also benefits the added luxury of tea & coffee making facilities as well as a Espresso coffee machine. 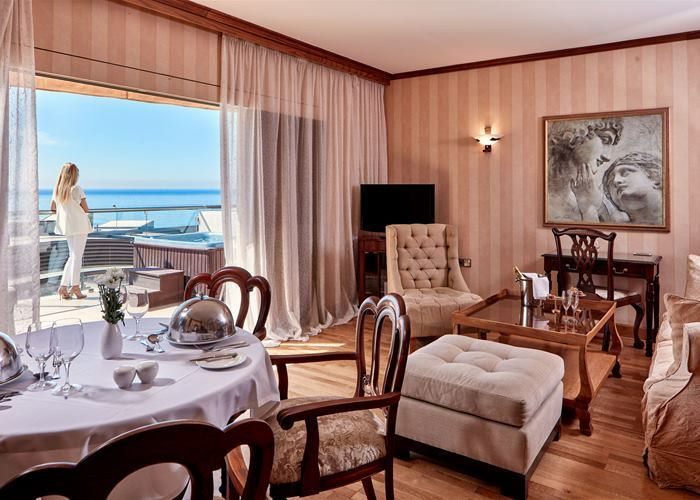 Indulge yourself to the Limonia Executive Suite which you can surely relax in, with astonishing sea views you’ll never want to leave your luxury accommodation. Space has not been questioned in this suite which sleeps 2 people. 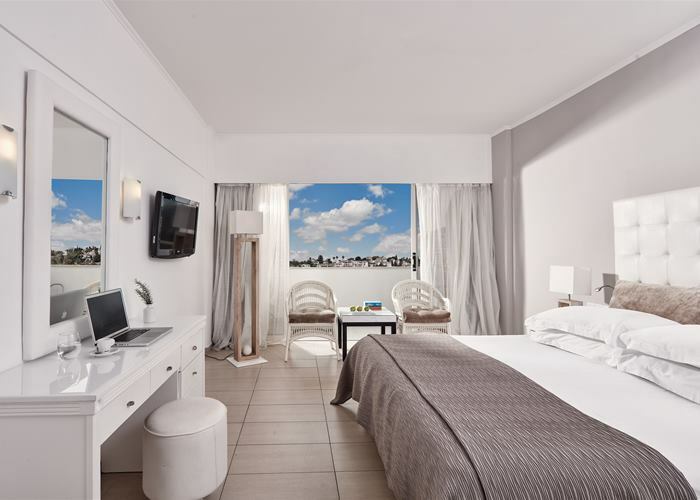 The separate bedroom has a double bed which leads directly out to a large balcony with your very own outdoor whirlpool, private sun loungers and umbrella. The large living room area has a dining area as well as a cozy sofa area for nights of relaxation and ultimate privacy. 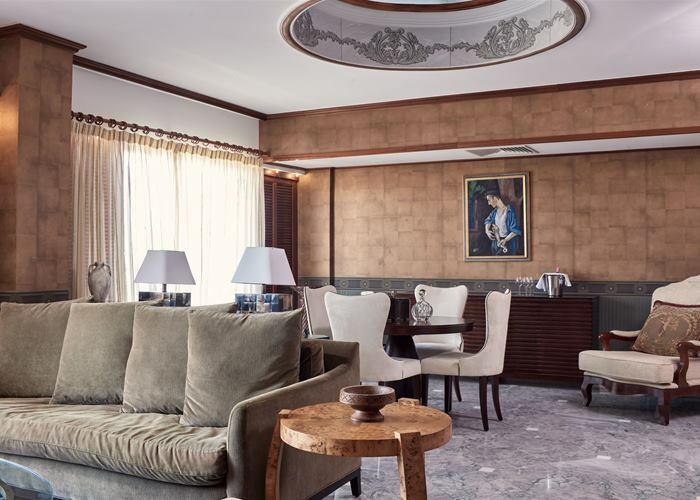 The room also benefits the added luxury of tea & coffee making facilities as well as an Espresso coffee machine. 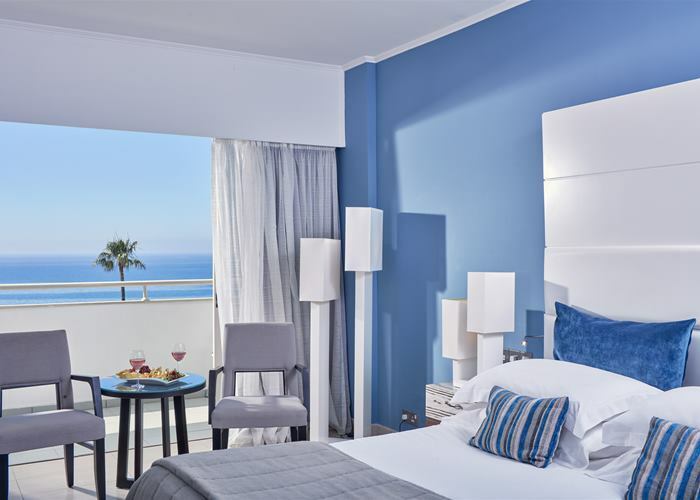 These spacious junior suites offer a true touch of luxury as well as offering stunning views across the sparkling blue Mediterranean Sea. 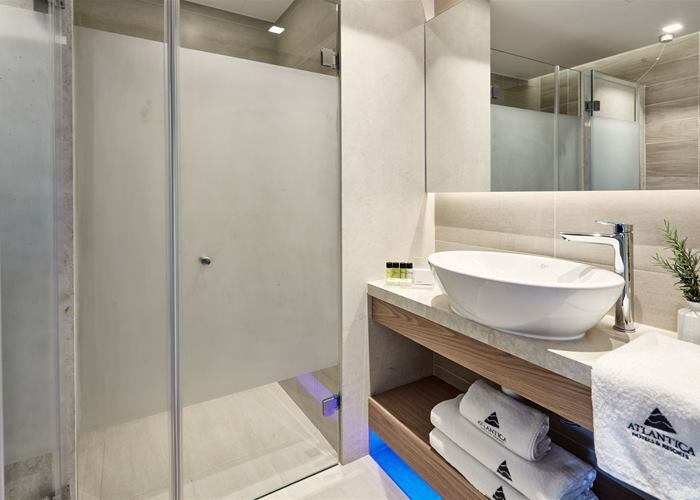 You’ll also have the added luxury of a balcony with your very own outdoor whirlpool, private sun loungers and umbrella, which is the perfect combination for unwinding after a day at the pool. 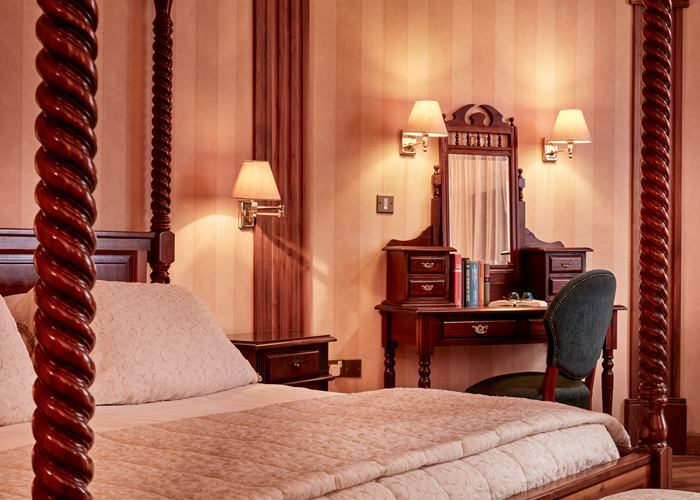 These rooms come with a king sized bed and sleep up to 2 adults. A welcome of fruit & wine await your arrival along with the included bathrobes & slippers, mini fridge, LCD and air conditioning. The room also benefits the added luxury of tea & coffee making facilities as well as an Espresso coffee machine making your living space a comfortable environment for your holiday experience. Our honeymoon suite is nothing short of spectacular and for that truly special occasion this room type has “love” written all over it. 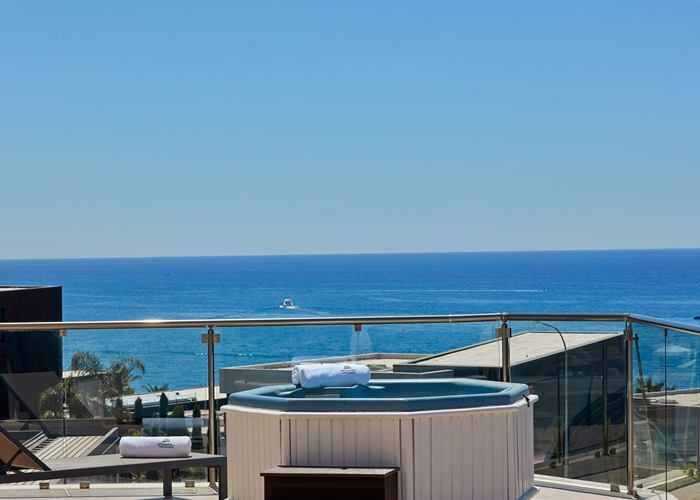 You’ll also have the added luxury of a large balcony with your very own outdoor whirlpool, private sun loungers and umbrella, which offers views across the pool and Mediterranean Sea. This room comes with a king sized four poster bed, sleeping up to 2 adults and you’ll also enjoy a sitting area with dining corner. A welcome of fruit & wine await your arrival along with the included bathrobes & slippers, mini fridge, LCD and air conditioning. The room also benefits the added luxury of tea & coffee making facilities as well as an Espresso coffee machine making your living space a comfortable environment for your holiday experience. 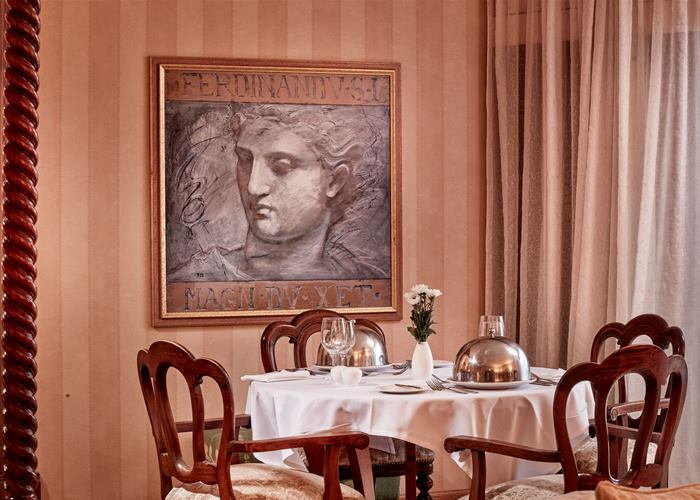 Named in honour of its first ever guest, the president of Greece back in 1998. 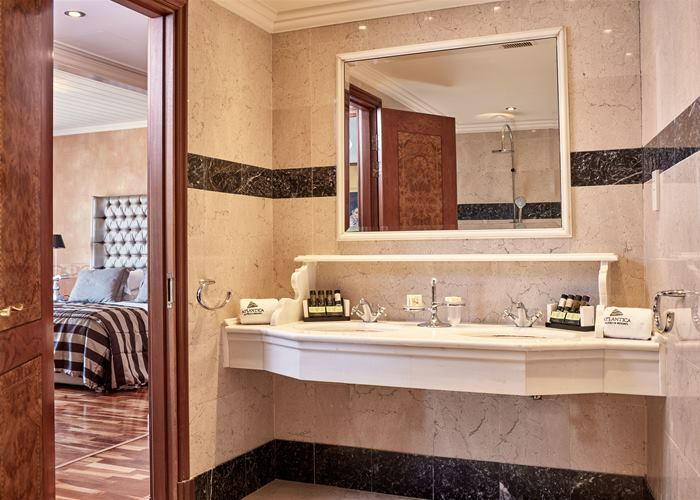 You’ll expect to find exquisite furnishings and is spread across 95 metres square; this suite is equipped with everything you could possibly want for a memorable holiday, no matter what the occasion. 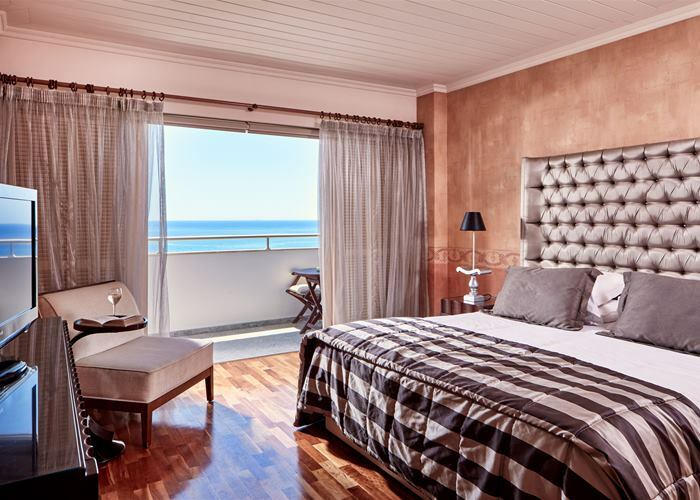 The separate bedroom has a king sized bed which leads directly out to a large balcony with the all-time ultimate panoramic sea view. The large living room area has a dining area as well as a large cozy sofa area for nights of relaxation and ultimate privacy. Rooms sleep up to 2 persons and also benefits the added luxury of a separate dressing room, home cinema, tea & coffee making facilities as well as an Espresso coffee machine.